You know all about the trouble with “mean girls” and competitive, judgmental women. Maybe you had a cruel high school experience straight out of the movie Carrie. Maybe you find yourself anxious because your daughter’s peers are excluding her. Maybe you’ve been harassed or marginalized by other females for being something they were or are not: fat, acne-prone, brainy, a different religion, too pretty, overconfident, a different kind of mother. Maybe you have a difficult female boss who is wreaking havoc on your ability to trust women in the workplace. And maybe you’ve shrugged it all off and figured: That’s just the way girls and women operate. In The Twisted Sisterhood, Kelly Valen picks up where her arresting New York Times essay about a painful sorority encounter left off. She pulls back the curtain on female relationships, revealing the troubling findings from her unique survey of more than three thousand women from all walks of life. Demonstrating the paradox of how we both support and sabotage one another, Valen’s research shows that although the vast majority of women report having at least one girl-friendship they wouldn’t want to live without, well over half approach female camaraderie with wariness or flat-out distrust and admit that they are unable—or unwilling—to extend themselves to certain types of women. An overwhelming majority say they have endured serious, life-altering knocks from other females, and a solid 97 percent of those polled believe it is crucial that we improve the female culture in this country. 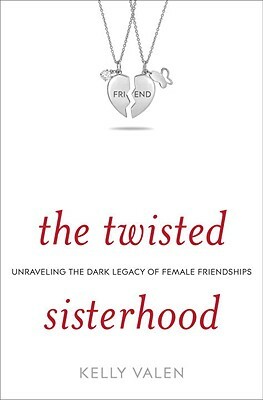 Laying bare the legacy of the belittled “girl wars” across a woman’s life, The Twisted Sisterhood exposes the hidden, enduring, and widespread fallout of our manipulations and highlights our residual undercurrent of distrust. Capturing the true attitudes of modern women, Valen gives voice to the lingering memories, ambivalence, and struggles so many of us are quietly experiencing and considers the net effect of our darker habits: an increasingly inhospitable and dysfunctional society of women. Valen also looks to the future, offering hope and practical ideas for how girls and their mothers, women, and “sisters” can come together and improve their profoundly needed female connections. Kelly Valen earned her J.D. from the University of California, Davis, where she was executive editor of the "Law Review." A daughter, sister, wife, and mother of four (three of them daughters), she practiced law with a Chicago-based firm for more than a decade. Her writings have appeared in "The New York Times, Los Angeles Times, San Francisco Chronicle Magazine, Chicago Tribune, Baltimore Sun, The Christian Science Monitor, Minneapolis Star Tribune," ""and other publications."" "The Twisted Sisterhood is a smart, savvy breakthrough look at the compelling, complex bonds that divide – and can ultimately unite – women of all ages and every culture." "Kelly Valen has written a smart, sweeping book about at the ways women relate and given us all something to think about."